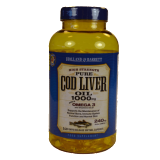 Cod liver oil has long been touted as a health supplement with protesting children being forced into swallowing spoonsful every day to keep them healthy, especially in colder, damper climates. These gelatine capsules provide the same benefit without the unpleasant taste or texture. Each capsule is surprisingly large – over an inch long! – but they are easy to swallow if taken with a bit of water. These capsule offer to aid in the maintenance of a healthy immune system, and benefits to bones and skin too. Holland and Barrett guarantee that their products are stringently subject to quality assurance testing at every stage of the manufacturing process. Using these capsules as part of a healthy, balanced diet is strongly recommended as food supplements alone cannot provide the nutrition that a body needs. Two of our testers were both very keen to try out this product: one had very recently switched to a High Fat/ Low Carb diet after years of low-fat eating and had dry skin, was prone to blemishes and often felt fatigued. The other is a health buff and cycles and swims quite regularly. 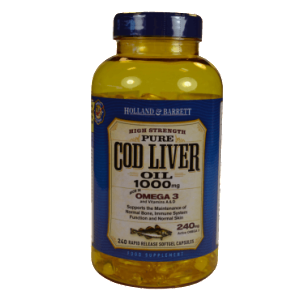 Both ladies invested in the 60-tablet bottle of Cod Liver Oil and each took one capsule in the morning, with their breakfast. Our fit lady did not notice an immediate difference, taking about two weeks to agree that her hair was shinier and that her skin seemed to glow with health. However, the difference in the first lady was quite incredible. While she cautions that much of her transformation could be put down to her new way of eating (she is following The Harcombe Diet, which advocates eating only real foods, nothing processed; not mixing carbs and fats; and ascertaining which foods affect you in order to avoid them going forward), she believes that some of the positive changes she has undergone are because of the cod liver oil capsules. From being a middle-aged looking woman, with papery skin and puffy eyes, our tester now looks at least five years younger, with fresh skin and clear eyes – eyes that look so much bigger now that the puffiness has gone. She has much more energy and has begun to exercise every alternate day, something that she hitherto did not have the energy for!